Located on the banks of the Noyyal River, Coimbatore is the second largest city in Tamil Nadu. A perfect amalgamation of tradition and trend, this city is one of the best south Indian cities, to settle down in. Surrounded by the Western Ghats, this city has the perfect weather that makes life a blissful experience. With more and more villas and apartments being built, Coimbatore has become a very practical and comfortable residential location. 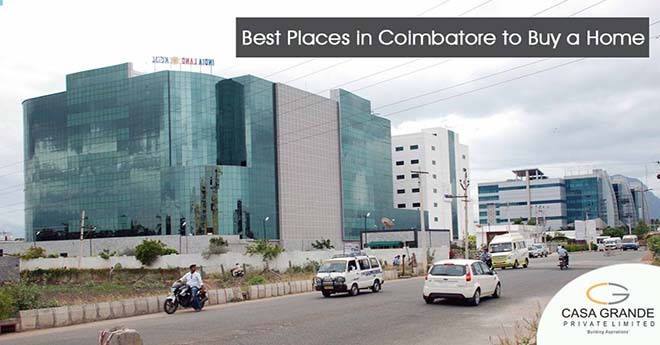 Let’s take a look at some of the best places in Coimbatore to buy a home. Located just 6.5 kms away from the Coimbatore airport, Singanallur is well-connected by roads and railways, making it one of the most appealing areas in Coimbatore. This locality is convenient for everyone as it has everything a resident wants. From schools close-by to posh restaurants, it is one of the opulent localities in the city. Singanallur also has some of the best restaurants and hotels like Hotel Aloft Coimbatore, RHR Restaurant, Hotel Anandha, etc. One of the nine large lakes in the city, the Singanallur lake is quite a refreshing spot in this locality. 3 & 4 BHK villas with contemporary new age architecture in a gated community will cost somewhere around 1.46 to 1.75 crores. Located near most of the major companies, industries, and budding corporate, Gandhipuram is one of the major commercial centres in Coimbatore. If you are looking to have your residence near your workplace, then Gandhipuram will be a perfect option for you. Gandhipuram is a great residential locality making it one of the best areas in Coimbatore. With great restaurants like Junior Kuppanna, Cloud 9, Anjappar, Ganache, etc., this place is a paradise for foodies. Apart from the eateries and commercial centres, there are plenty of premium educational institutions, hospitals, and some government offices located in Gandhipuram making it a comfortable place to reside. This neighborhood is the heart of Coimbatore. Situated close to the airport, Trichy Road is one of the most luxurious areas in Coimbatore. With well-known schools like St. Francis Anglo Indian Girls High School and Alvernia Matriculation Higher Secondary School, the apartments and villas here are perfect for residents who are planning to move in with their family. Attractively priced apartments and villas are sold here in a price range of Rs. 69 Lakhs to Rs. 2.4 Crores. With amenities like shopping complexes, high-end salons, groceries, and hospitals nearby, being a resident here is a once-in-a-lifetime kind of experience. Also, if you are planning to move to Coimbatore from one of the metro cities, this locality offers the convenience of the metropolitan cities with the tranquility of Coimbatore. The amazing neighbourhood of Kalapatti is known for lifestyle essentials like peace, comfort, opulence, space and style. Multi-speciality hospitals like Park Hospital, Aandal Hospital, etc. are present here making life easy and convenient for residents. Furthermore, with schools like Zee School, Saran Matriculation School, etc., Kalapatti is among the best areas in Coimbatore to settle down in. This suburb has a demographic advantage of being in midway between the two important national highways, Avinashi road (NH-47) and Sathy road (NH-209). Casa Grande’s Eternia has already been a successful project, and Eternia II is now on sale! The range of residential homes is just 10 minutes away from Avinashi Road. Surrounded by international educational institutions and companies, Kalapatti is one of the best areas in Coimbatore to live in. If you prefer to live in a posh locality with a very elegant neighborhood, Sai Baba Colony is the one for you. Situated just 4 km north of Gandhipuram, this place is named after the famous Sai Baba Temple that is located here. Apart from which the famous Zion church is also situated here. Known for its calm residential lifestyle, this locality has a lot of independent houses and some apartments. Located on Palakad road, Kuniamuthur is 6 kms away from Coimbatore Junction and about 17 kms away from the airport. With close proximity to the Taj Hotels, Park Royal Inn, etc., Kuniamathur is one of the best places in Coimbatore for a city lifestyle. Also, this locality has one of the busiest markets in Coimbatore. With a lot of CBSE schools and best colleges in the vicinity, Kuniamuthur has apartments and villas starting from as low as Rs. 20 Lakhs. Just 3.5 kms away from Ukkadam bus stand, Casagrand is all set to launch Kuniamuthur’s first lake-view villas. Rathina Sabapathi Puram, popularly called RS Puram, is a completely residential area that is also known as the shopping district of Coimbatore. One of the best areas in Coimbatore due to its prime residential infrastructure, R.S. Puram is 12 km away from the Coimbatore airport. A perfect amalgamation of commercial and residential amenities, R.S Puram is proliferated with a lot of commercial establishments, government offices, educational institutions, large shopping complexes, sprawling sporting facilities, etc. Apart from these, the area also has a lot of tourist spots, restaurants, and some cultural centres, where people can relax with their families over the weekend. The Diwan Bahadur Road, i.e. the D.B. Road, here is quite well-known for shopping. An arterial road in Coimbatore, Avinashi road is one of the popular areas in Coimbatore and is one of the top localities for NRI investment. With well-known educational institutes like PSG Colleges, Coimbatore Medical College, and Coimbatore Institute of Technology, this area also houses research institutes, museums, art galleries, etc. Surrounded by shopping malls and luxurious hotels, the lifestyle of this area is nothing short of living in a metropolitan city. With multiple residential areas to choose from, it is no doubt that Coimbatore is a city that offers a varied and exciting lifestyle. If you’re looking to settle down here or simply to invest in one of the many prime areas in Coimbatore, then head over to Casagrand to find the perfect property.